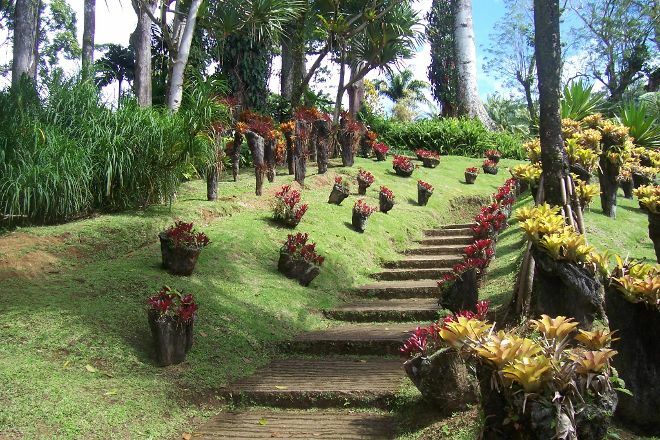 Wander and observe exotic plants and flowers in the beautifully sculpted Jardin de Balata. Explore the gardens, nestled in the jungle-class mountains of the island, and set around the designer’s childhood Creole home. Take winding paths through expertly manicured gardens, or traverse suspended pathways in the trees, affording spectacular views of the site and its surrounding countryside. Consider bringing comfortable shoes, as the trails can be hilly at points, and be sure to bring along a camera to capture the picturesque vistas. By using our Fort-de-France day trip planner , you can arrange your visit to Jardin de Balata and other attractions in Fort-de-France. The garden is well structured. Many species of Palm trees. Good time, but still too expensive. Madinina deserves its name and there you have a very nice overview. Feel free to enjoy this haven of peace. 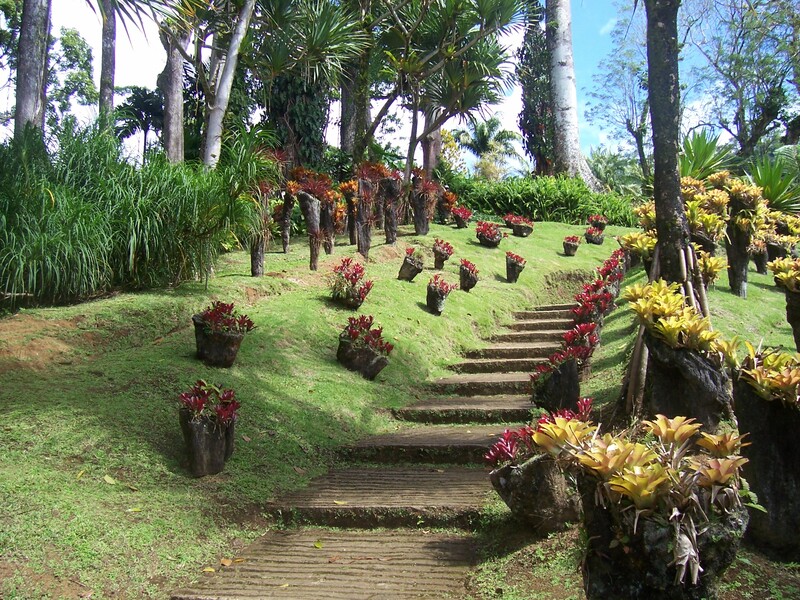 A wonderful stroll amidst the flowers and other exotic plants on the heights of Fort de France. A must to see botanical park while on Martinique. Beautiful scenery and great variety of tropical flora. Nice suspension bridge with gorgeous views. A complete walk through will take about 1.5 hours and the route is perfectly organized. Very interesting to adults and kids. Excellent garden, carefully designed and laid out to display the many flora of Martinique. Nearly all of it is wheelchair-accessible. A nice restaurant to boot. Main road N3 takes you there from Fort de France - no tiny lanes or difficult maneuvers. Get in by 4:30p.m.! We were very lucky to be allowed in at 4:32p.m. These gardens are some of the most beautiful places on earth. The atmosphere of some places can’t even be described. The garden is divided into various adjacent areas with different themes. The rope bridges offer some amazing views of the nearby valley. I absolutely recommend this place to tourists and to locals who need a break. The most beautiful botanic garden I have ever seen. You can enjoy not only the flowers the Blossoms but also lot of small colibri birds. They are flying everywhere getting drops of nectar from the blossoming flowers. There is also a bath in the trees. It's a rope bridge which needs a bit of courage to enter but you will definitely enjoy it. The garden is also safe for children. So you don't need to worry there are no alligators or any other dangerous species. Just the birds flowers and trees. The staff is also kind. The entrance fee is a bit expensive but it's worth it. Parking is free. I suggest taking some food and water with you. Get there right when they open! We arrived a little after 9 and stayed about 2 hours. It was getting crowded when we left, and there were even tour buses there. They have many different plants, and explanatory signs in English and French. We enjoyed the rope bridge walk the most. It’s €14 per adult. Staff we encountered spoke English. Every day, we help thousands of travelers plan great vacations. Here are some tips on how to use your Listing Page to attract more travelers to your business - Jardin de Balata. Promote your permanent link - https://www.inspirock.com/martinique/fort-de-france/jardin-de-balata-a15618833 - on your website, your blog, and social media. When a traveler builds a plan from this page, the itinerary automatically includes Jardin de Balata. This is a great way for travelers looking for a great vacation in your city or country to also experience Jardin de Balata. Promoting your link also lets your audience know that you are featured on a rapidly growing travel site. In addition, the more this page is used, the more we will promote Jardin de Balata to other Inspirock users. For best results, use the customized Trip Planning Widget for Jardin de Balata on your website. It has all the advantages mentioned above, plus users to your site can conveniently access it directly on your site. Visitors to your site will appreciate you offering them help with planning their vacation. Setting this up takes just a few minutes - Click here for instructions.